Environment plays an important role in developing a healthy hoof. A natural environment is best, where a horse is allowed to roam free, as movement stretches and strengthens joints and muscles in their entire body, promotes healthy gut activity and stimulates hooves. Hooves should be put to work. It is through movement and stimulation that hooves can grow strong and healthy. 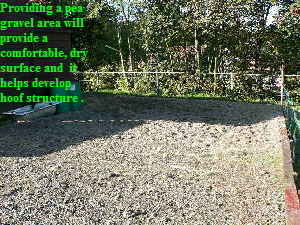 An ideal environment would contain various surfaces. Horses need the company of other horses, being separated from other horses will cause stress and anxiety which creates chemical imbalances effecting horse and hoof. For equines in the UK a significant aspect of husbandry will be assessing the effects grass is having on the whole horse. Mineral imbalance and overloads of sugar from much of the UK’s grazing is a major factor in poor horse health and performance. Getting the right balance is essential. Extract from Equine Matters. Spring 2008 issue. THE BLUE CROSS charity. A leader in animal welfare and education based in the UK. ‘So, what is ‘welfare’ and are you doing right by your horses ? I have recently been lucky enough to attend lectures from two distinguished vets on this very subject: Professor Daniel Mills BVSc, PhD, ILTM, CBiol, MIBiol, CCAB MRCVS, leading professor in veterinary behavioural medicine at Linoln University and Professor Derek Knottenbelt OBE, BVM&S, DVM, DipECEIM, MRCVS, head of equine studies at the University of Liverpool and a prominent ambassador and forthright proponent of equine welfare. ... Professor Knottenbelt used a quote ‘The penalty the horse pays for domestication is disease.’ Horrors ! But he is right: obesity, breathing difficulties, gastric ulcers, laminitis, equine metabolic syndrome, colic and joint problems, are all to an extent ‘man-made’ and are unparalleled in the wild horse. At the blue cross we strive to improve the mental and physical environment for our horses, many of which have come to us with problems because people may have made mistakes in their previous care and management. We know the cost of lack of mental stimulation, fiber in the diet, company, movement and fresh air - the horse can become a very sorry or aggressive creature. We strive to educate people on this and rehome these horses to fantastic knowledgeable caring homes. Professor Mills spoke about guarding against being swept along by what is ‘usual’ stating ‘Common Practice is not necessarily Good Practice.’ He used the example of some yards where horses are kept in a stable for 24 hours, unable to touch other horses and without occupation and the resulting stable vices which are accepted as ‘normal’. Here, interestingly, I have found that often it is the relatively new horse owner who may have a better sense of what is right and what feels wrong as they are unencumbered by tradition and are prepared to challenge and question the way things are done. Common sense is needed in abundance, together with a desire to constantly strive to improve things, when it comes to horse ownership. Gut instinct is often right where animal welfare is concerned. The ability to choose where to go and what to do is just as important for horses as it is for ourselves. The reason horses fight each other is to attain a ‘position’ so they can move when and where they want - freedom of choice. It is important to look at environment from the horses point of view. Horses are confined in the domestic environment on many different levels, but making their environment interesting and offering as much freedom of choice and movement reduces the impact of psychological stress. The term scientists use is ‘enriched environment’. Research dating back to the 1950’s has proven an ‘enriched environment’ reduces fearfulness and anxiety, increases habituation to unfamiliar objects and counteracts boredom associated with confinement, therefore reducing stress. Animal and human welfare is significantly effected. By offering choice, freedom and stimulation both horse and hoof will be healthier. To use a human analogy - a person serving a prison sentence is told when to eat, sleep, exercise, and work in a confined space albeit having access to several areas within the facility at certain times of the day... A person in a holiday resort is ‘confined’ but they can choose when to eat, sleep, relax, exercise, interact with others, and access lots of interesting and fun things to do. Providing an enriched environment for a horse will make a world of difference to their well being as it can for our own. DR Robert Bowker. VMD. Ph.D.